﻿International Day of Democracy: Calendar, History, Tweets, Facts, Quotes & Activities. International Day of Democracy seeks to promote and uphold the principles of democracy. Democracy refers to a government ruled by the people through representatives that have been elected by the whole population. Democracy is tightly connected to human rights, more specifically the right to political and civil freedom, as democracy ensures equitable participation from all members of society. Only 4 countries in the world do not claim to be ruled by democracy however, more than 100 other countries have non-democratic or partially-democratic governments; these countries are home to more than half of the world's population. 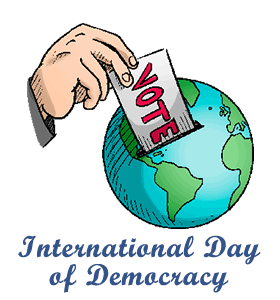 International Day of Democracy was designated by the United Nations General Assembly in 2007. It is observed annually on September 15th. The theme for International Day of Democracy 2017 is Democracy and Conflict prevention. The 4 countries in the world that do not claim to be democratic are: Saudi Arabia, Burma, Brunei and the Vatican City. There are only 5 countries with a population of over 500,000 people that did not hold elections between 2000-2012. They are: China, Eritrea, Qatar, Saudi Arabia and the United Arab Emirates. Deliberation and debate is the way you stir the soul of our democracy. – Jesse Jackson, American civil rights activist, Baptist minister and politician. Attend the “Space for Civil Society” event that was held at the UN headquarters in New York. It is composed of a sub-group of the UN executive committee that is working in cooperation with the Institute for Democracy and Electoral Assistance. It promises to be a riveting discussion about democracy today and in the future. Spread awareness by using the hashtags #InternationalDayofDemocracy, #StrongAndFree and #DemocracyRules. Watch a video on the struggle for democracy and human rights in the world. Some suggestions are: The American President (1995), Election (1999), and 12 Angry Men (1957). Take time to learn about different types of government in the world. Examine systems such as communism, monarchy, ecclesiastical, totalitarian, dictatorship and oligarchy. Read a book about the struggle for democracy and human rights around the world. Some suggestions are: Democracy in America , On Liberty and Democracy Incorporated.